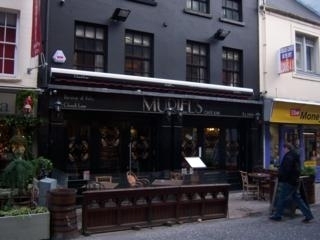 Muriels Cafe Bar, 12-14 Church Lane. Have you got Google Earth on your computer? If so, then download the Google Earth view of Muriels. Click / Tap the button above to get directions from where you are to Muriels. Really lovely bar; decor original, atmosphere good and staff are friendly. We had platter snacks one evening, which were great, however lunch is very disappointing! 'Fish bake' was tiny, with pretty much no fish at all to be seen! It consisted of a tiny bowl of runny sauce with fries and a small salad for £8 . Really disappointed and not impressed!!!! Will def go back though but only for drinks, coffee or snacks. I've been here three times on a Saturday night, and I've never had any bother getting in. Nice small bar, which is well staffed and gets a decent mature clientele, they even had a dj on last night! My only gripe is with the gents toilets, there's not enough of them. Overall highly recommended. "cupcakes", "prosecco" and "rif raf (sic)" from the previous commentator just goes to confirm the pompous, condesending and self deluded nature of this place and it's, non riff raff, clientele. If you want to enjoy your hard earned money without being judged because you don't round your vowels or appear to have a bad smell under your nose then, please, avoid this menagerie. Fabulously stylish, quirky, beautiful yet laid back and comfortable little gem of a place... delicious cupcakes and prosecco! The fact that they don't allow rif raf in is a wonderful thing- don't knock it! Pompus bar, pompus staff, pompus clientelle!! When the 'regulars' find a new trendy place they will be off in a shot! This quirky bar has a short life span, unfortunately. Fantastic decor ..need a few proper beers ..a nice guest ale would be good, also takes so long to get served as the staff are making cocktails and a superb job they do,but takes forever so more staff needed .. This bar could be really great bar but unfortunately it seems to be totally stuck in the 90's, which was the last time I heard the phrase 'regular's only'. It's so absorbed with itself and its 'regulars' it seems to forget the rest of the public, local and tourists and therefore comes across not as quirky/cool but stuck up/old fashioned. Shame really it could have been a pretty cool bar. There's more to Belfast/Ireland/The World than this poor excuse, thankfully won't be back. They seem to be under the impression that the national minimum age for entering a bar is 25! They turned us away because I am 23...it wasn't even busy, just a quiet week night. This has totally put me off. I won't go back even in two years time. The suggestion that under 25s cannot behave appropriately simply causes offence. We were a lot more sensible than most of their customers. Its owned and run by the same people as the Spaniard, up the Street (up its A***). So no surprise about the "door policy"! Read recent reviews about the Spaniard and you will get my drift. I have been coming to this little bar for at least 6 months now, so you can imagine my frustration when I was denied entrance early on a Saturday evening! I was told, in no uncertain terms, that the bar was for regulars only! As I tried to explain to the fair haired woman on the door that i was in at least once or twice every week, she was having none of it, and dismissed myself and my company very abruptly! This ruined my plans for the evening and has tarnished my views about this once welcoming bar! The new woman on the door is only putting good, honest people off! Quirky little bar, great atmosphere, great service. Loves it! Out of the way and not really worth looking for. Nice enough bar, staff not overly rude but getting there, medium selection of drinks. Average on all accounts.